We are having a Holiday Party and you are invited! The Men of the Moose Lodge #1081 in Bloomington are graciously hosting and feeding us this year on Thursday, December 12th from 5:30 to 7:30pm for the Annual LIFEDesigns Holiday Party. The men of the Moose Lodge are donating the location and the food for the evening. How wonderful! The Women of the Moose Lodge #1081 in Bloomington are volunteering that evening to serve and providing gifts for everyone. The women of the Chi Delta Phi sorority are also going to volunteer that evening to serve and are bringing gifts as well! DJ’s Frank and Amy of the Moose Lodge #1081 in Bloomington are donating their time and talent to provide music and entertainment for the evening. Without all of these generous groups, this party would not be possible. Thank you so much! The Moose Lodge #1081 in Bloomington is located at 840 S. Cory Ln. Gifts will be given out to everyone who attends and Frank and Amy will entertain us all with their holiday music medley! Come join us as we enjoy wonderful food, the company of friends and dance the night away to celebrate the holiday season. We hope you will join us! To arrange for a ride, please call 800-875-9615 as soon as possible. Click here to see the full LIFEDesigns‘ Holiday Party Invitation. 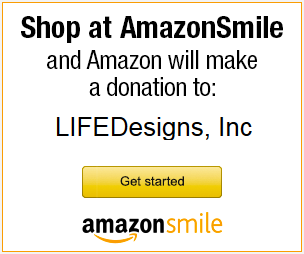 To donate gifts for us to give to the individuals with disabilities we support, please contact us at support (at) lifedesignsinc.org or call 812-332-9615 and ask for Leslie Abshier. Thank you for the gifts you give to our customers this holiday season! Art of Chocolate Tickets on Sale NOW!